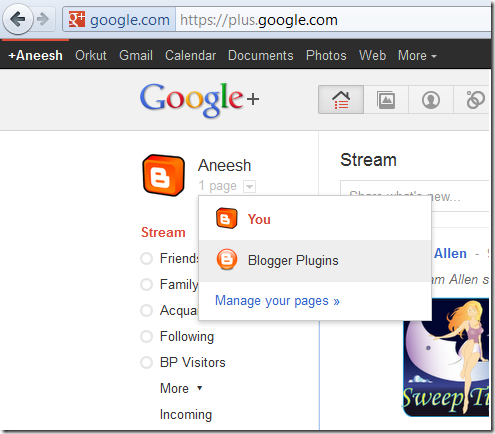 If you have already created a Google Plus Brand Page, then it is time to promote your Brand Page right from your Blog. You can do so by adding a Google Plus Page Badge on your Blog. The Page Badge has two variations.The standard badge displays the profile pictures of the people who have +1 ed your Brand Page along with the +1 count and an Add to Circles Button. The badge has a minimal version as well. 1. To add the page badge, you should first know the ID of your Brand Page. To do that , just login to your G+ account at http://plus.google.com. Once you hover over your profile name, you can use Google Plus as a Brand Page by selecting your new Page from the Hover Card. Once you do this, you will be taken to your Brand Page. The URL in the address bar is the link to your Google Plus Page. You must have noticed that there is a number at the end of the URL. Copy that number in the URL. That is your Brand Page ID . 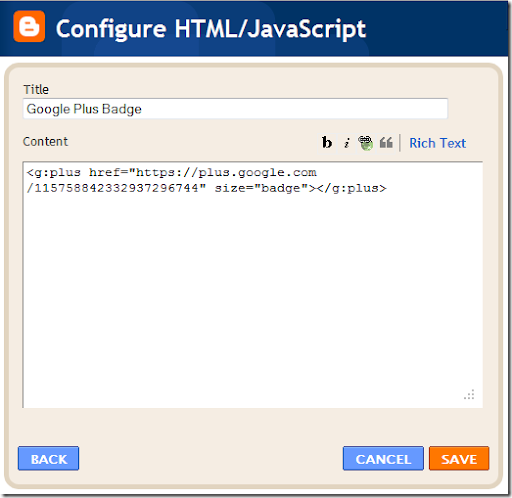 We will need this Brand Page ID to create the Google Plus Page Badge. You can change badge to smallbadge if you need a smaller version of the Page Badge. The smallbadge as the name says is a smaller version of the badge. It doesn’t have the profile pictures. It is same as the one that I’m using here on my Blog’s Sidebar.Now we have the code to display the Page Badge. Now Paste the Copied Code into the Gadget and Save it . You can give an appropriate title to the Gadget if needed(optional). 5. Save the Template and you should be able to see the Badge on your blog. 6. You are not done yet.It would be great if you have us in your circles :P. You can use this page badge to do that. hey.can you create "share on google plus button"? @picturequiz - the google plus one button already does that. is there any way i can make it work in my blog? thx! 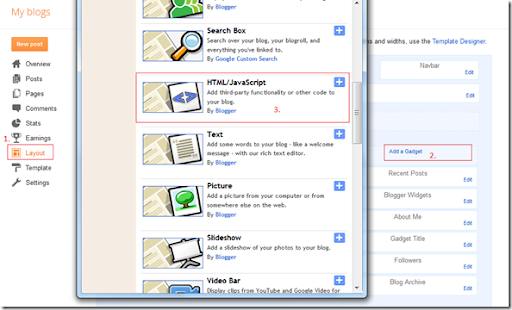 @Marcio Ribeiro Jr - As of now Blogger doesn't allow us to add Custom Gadgets to dynamic view templates. Is it possible to change the width? It goes over the width of my right side bar. I got as far as looking for head in my template but found no such thing - neither in my template nor on the edit html page. Could you please give me an idiot's guide to how I go further. As of now, I do not see the badge. Whew. Done. Please ignore my previous query. I followed the steps-www.ugochi-jolomi.com, but it didn't appear on my site.